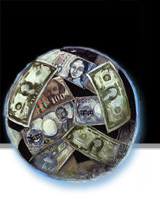 Founded more than thirty years ago, The International Economy is a specialized quarterly magazine covering global financial policy, economic trends, and international trade. Labeled by the Washington Post “that precocious Washington [quarterly],” the publication is edited for and read by central bankers, politicians, and members of the financial community including professional investment managers, macroeconomic specialists, and high net-worth global investors. Widely recognized and quoted in the popular business press, the focused editorial content has attracted a loyal readership base among the world’s most powerful and influential decisionmakers. Over thirty years ago, five hundred guests stood at a VIP reception at the Federal Reserve in Washington as then-Chairman Alan Greenspan welcomed the new publication into existence. Within months, the Washington Post described The International Economy as “not some tiresome, gray journal but a publication consistently ahead of the curve.” The New York Times defined the magazine’s role within the international community as follows: “Economist to economist, in English.” Later, the Washington Post said the magazine was “targeted to—and written by—the power brokers in the world of finance.” From the start the magazine became an instant policy bulletin board for the world’s decision makers, particularly for G7 policymakers. There are a number of reasons for The International Economy's strong support from the policy community, but the most important is the publication’s intellectually independent editorial content. When Russian leader Boris Yeltsin was about to assume office and the international community was fixated on the nature of his economic reforms, Yeltsin’s chief economic strategist Grigory Yavlinsky came to Washington and met with various news outlets and think tanks. He chose The International Economy to publish the full text of Yeltsin’s economic/financial reform plan. The day after its publication, the New York Times ran a three-page story crediting The International Economy for this scoop, with other papers following suit. One reason the Russians chose this particular magazine was that they saw its broad base of writers from the highest echelons of the policy world, from then-Secretary of State James A. Baker III to then-Japanese Prime Minister Kiichi Miyazawa, from foreign policy expert Zbigniew Brzezinski to global international financier George Soros, from Republican Richard Perle to Democrat Larry Summers. 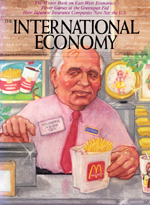 In 1990, the magazine won an award for its cover depicting Mikhail Gorbachev, then Soviet leader, working at a McDonald’s checkout counter. One additional reason for The International Economy’s visibility is that the publication has sponsored a series of highly publicized and influential global conferences involving many of the world’s most senior policy officials and the media. These conferences took place over the course of a decade in Tokyo, New York, Washington, Frankfurt, Vienna, and Zürich. In 1988 in Zürich, one of the conference participants, Senator Bill Bradley, floated a proposal for Third World debt restructuring, the outlines of which the Bush I Administration eventually adopted. The concept was subsequently labeled “The Brady Debt Plan.” Scores of reporters at that conference raced for the telephones when U.S. Treasury official David Mulford publicly announced agreement with the general Bradley debt restructuring concept. Every several years, The International Economy honors a designated “Policymaker of the Year.” The award ceremony is held during the time of the IMF/World Bank meeting where hundreds of officials, private bankers, and international journalists attend a private reception. Alan Greenspan received this award at a highly publicized ceremony in Washington. European Central Bank head Trichet received the award before an audience of more than a thousand officials and bankers/investors in Tokyo. Karl Otto Pöhl was honored at a ceremony in New York, as was Bundesbank President Hans Tietmeyer. Clinton Treasury Secretary Lawrence Summers has also received recognition from the magazine. The International Economy has fought to remain a niche magazine, refusing to follow the trend to dramatically broaden in its editorial base. Other magazines have over the last twenty years tried to compete with the publication, and none have succeeded. For example, the Davos organization which sponsors the annual World Economic Forum in Davos, Switzerland, set up a competing publication which ceased any meaningful circulation within a few years. Other institutions have set up similar magazines. Even given the prestige of several of these institutes, the publications closed their doors within several years. One reason the publication has endured is that the international community has seen over the last three decades the emergence of an international economic statecraft of sorts. This statecraft now sits side by side with the statecraft long established during the Cold War in the field of foreign policy and defense. That latter statecraft of course enjoys the benefit of important publications such as Foreign Affairs and Foreign Policy. After more than thirty years of existence, The International Economy finds itself in a uniquely exclusive role as part of the new international economic statecraft. Important decision makers pick it up precisely because it has been around so long. All know it and trust its content. All of these activities have served to create an identification of the brand. The International Economy is unlike virtually any other magazine in that it is targeted almost exclusively to the financial policy elite. Today there are roughly 10,000–20,000 economic and financial opinion leaders internationally of whom perhaps 3,000–5,000 truly impact the global economy as the prime movers in the public and private sectors. This is The International Economy’s target audience. It is a skeptical crowd—very tough to reach where the number one commodity is credibility. It is hard to put a value on The International Economy’s credibility within this elite, behind-the-scenes world of global decisionmakers. These are not the kind of readers who respond to mail solicitations or telemarketing calls. They pick up The International Economy precisely because, after thirty years of brand identification, they trust the publication’s intellectual content, value, and character.